Publisher: Women Who Write, Inc.
Where family legends are created - around the table. Come back with us, to the sweet aroma of fresh mown grass and backyard gardens, aprons with front pockets bursting with fresh picked apples and café curtains swaying on a breeze. Come back with us, to the sweet aroma of fresh mown grass and backyard gardens, aprons with front pockets bursting with fresh picked apples and café curtains swaying on a breeze. We’ll be in the kitchen preparing Aunt Sis’s fabulous mince meat pie. Come sit around the family table of yesterday and remember loved ones, their jokes and conversations, their quirkiness and cantankerousness. Come and remember how family legends have been created for generations, around the dinner table. This book is an anthology of family memories built around favorite recipes. It is the result of our first ever Story with Recipe Contest. The winners were judged on their story, not on the recipe. 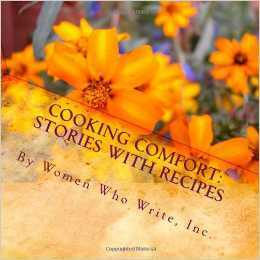 We hope you will enjoy the stories and the recipes as much as we have. Women Who Write, Inc. is a 501(c)(3) non-profit organization. Our Web site is www.womenwhowrite.com. Our mission is to welcome, encourage, educate and support women who aspire to write. Our membership is open to all women who want to express themselves in writing.